I’m kind of a kid myself, and I love being around them. In April of 2018 Lincoln was diagnosed with ITP (Immune Thrombocytopenic Purpura) or in other words, low platelet count. His count was 4,000 when he was admitted to Blanchard Valley Hospital in Findlay, and he was down to 1,000 when he was transferred to Nationwide Children’s Hospital in Columbus. Normal counts should be 150,000-450,000. With many blood draws and 2 transfusions this kid has never complained. He missed his first grade field trip with his friends to the Toledo Zoo, and he missed some baseball games during the summer. We are just trying to get his counts back to where they should be to be a normal 8 year old. This is why I’m would love to give Lincoln a great way to start his 2nd grade year! Thanks to John LaRiche and the team at LaRiche Chevrolet-Cadillac, I had a hot 2018 Chevy Camaro RS Convertible for the day, so I headed to Lincoln’s house to pick him up. On the ride to school I learned about the things he was most looking forward to, (lunch and recess) the inside info on 4-wheeler charging systems, (if it dies, wait for your dad to come and jump it) and how I could handle it if people don’t like me, (just be yourself) from Lincoln. When we pulled up to Liberty Benton Elementary, boy were they ready for us! I think every single teacher and administrator was waiting on those front steps with a LOUD cheer for Lincoln’s big return to school. There are great kids starting school this week all over our area, and I wish I could’ve driven all of them to school. I hope you’ll take a few moments as students work through the nerves of a new routine, and tell them just how proud you are of them, and through the chaos of the school year, find the chance to really appreciate the great joy that comes from being around kids. 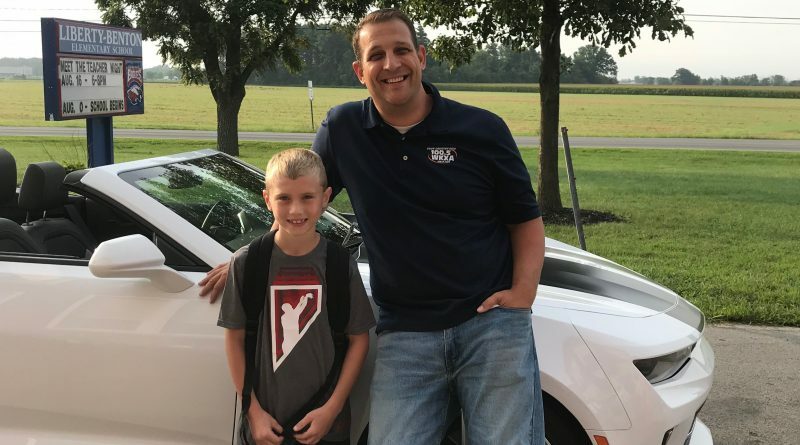 Thanks to Lincoln’s mom for nominating him, to LB Elementary for being so welcoming, and to John and the team at LaRiche Chevrolet for partnering up with us again to send a great kid Back to School In Style!